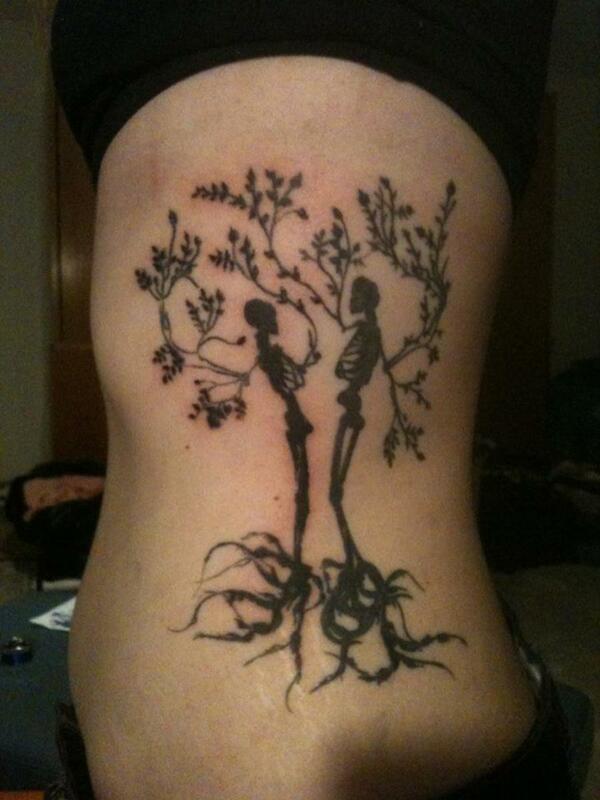 Tree tattoos are probably my favorite themes of body art. 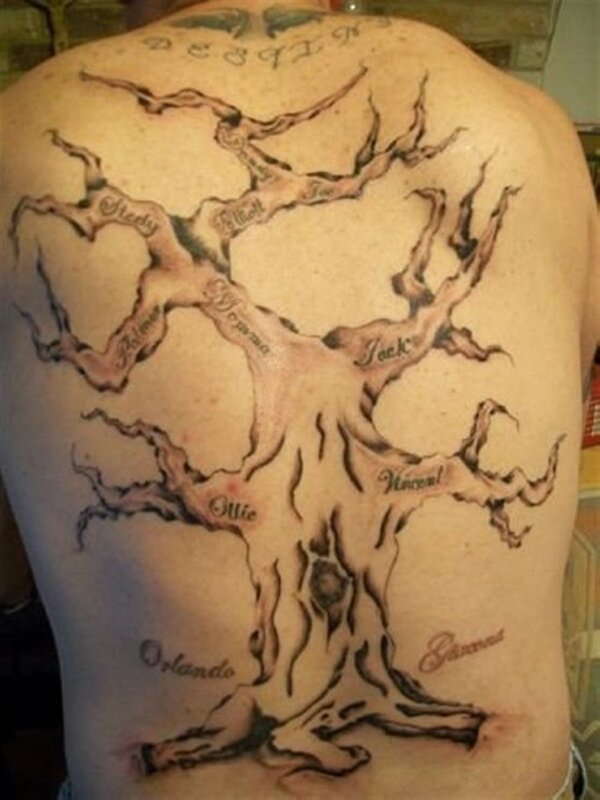 I'm not sure why it is, but when I look at the variety of tree tattoo designs, they really capture my attention. As a piece of art in and of themselves, they are very enjoyable to look at and appreciate. 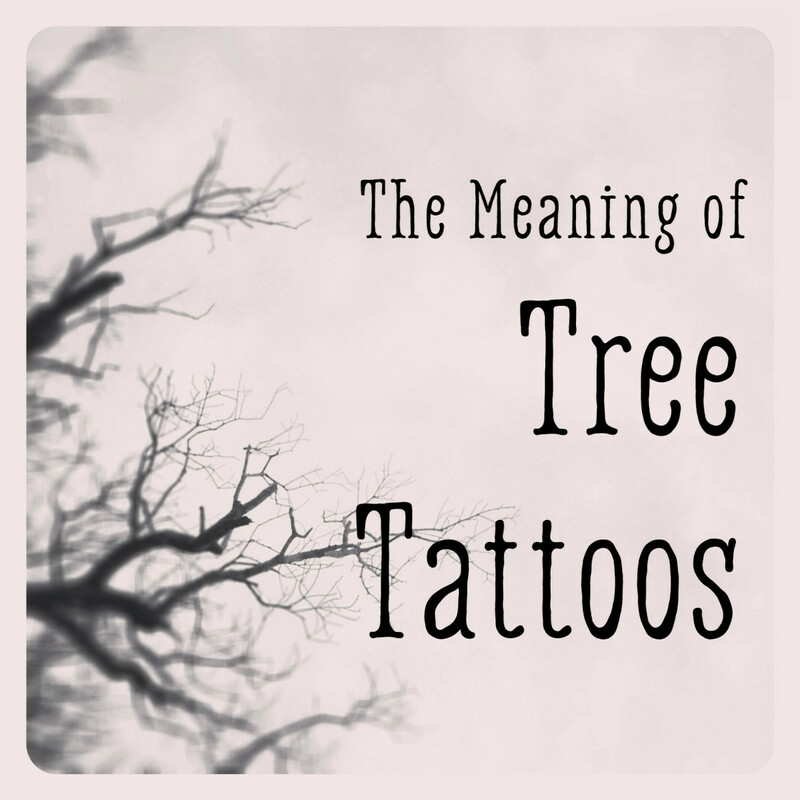 Sometimes it is easy to miss what it is exactly a tree tattoo is portraying. At times it can be a representation of a family tree. This can be obvious from the names included on the various branches, and other times not as obvious, with the tree overlaying the chest, with a heart at the roots, close to where the human heart is. 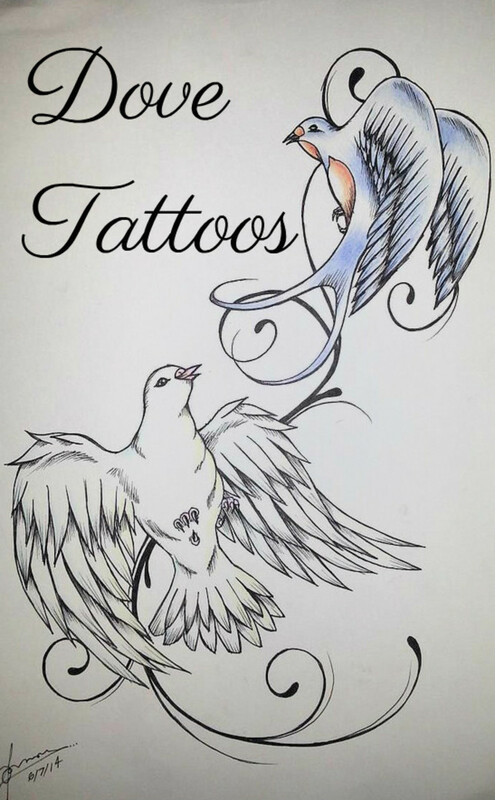 Both of those are included below, and give good ideas of what can be done if you're wanting to have a family tree inked on you. 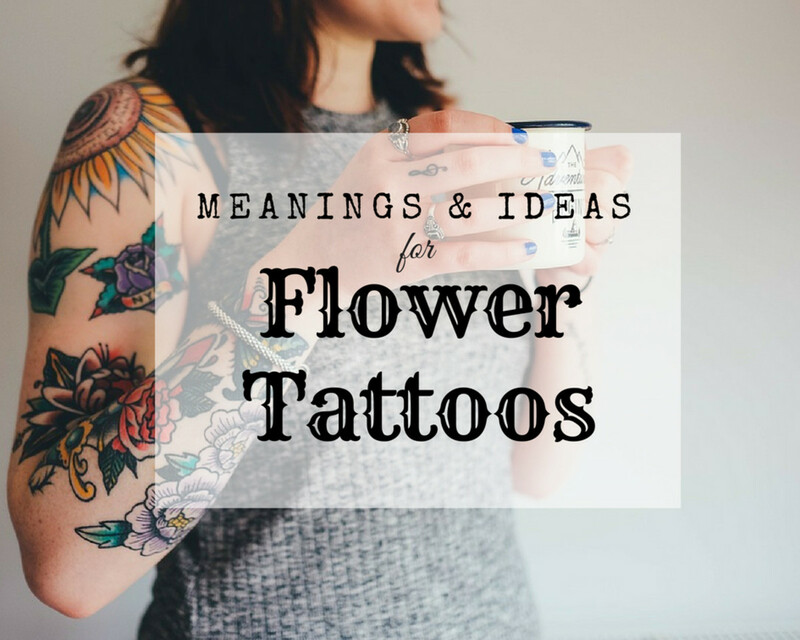 There are a wide variety of tree tattoos; too many to include in one article. But I've included one of a male and female tree skeletons; possibly pointing to the memory of departed parents. There is also a great palm tree tattoo that is a step away from the other tattoo tree types, which have a similar look. 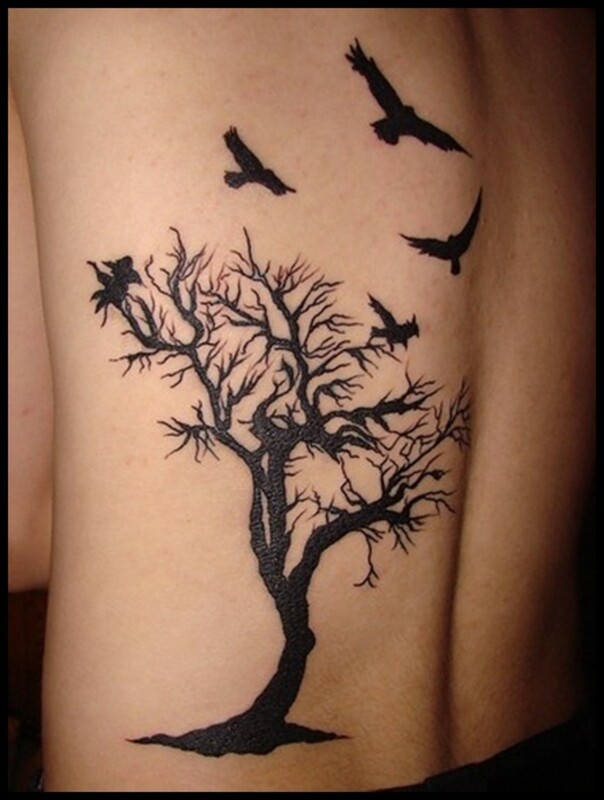 The most popular tree tattoo designs are without a doubt a tree without leaves with a bird or flock of birds sitting in the branches, or flying away. That appears to suggest the family growing up and leaving home to establish their own lives. 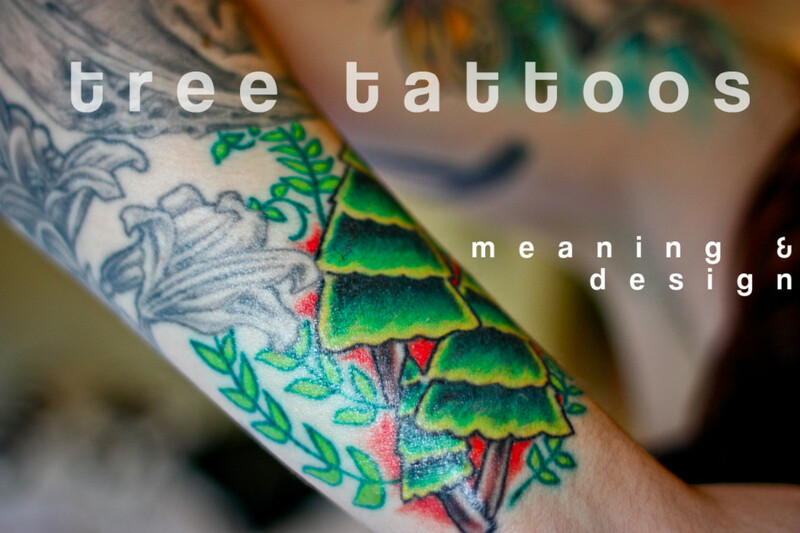 Whatever the meaning and reasons, tree tattoos are an awesome choice if you're thinking of getting some ink done. 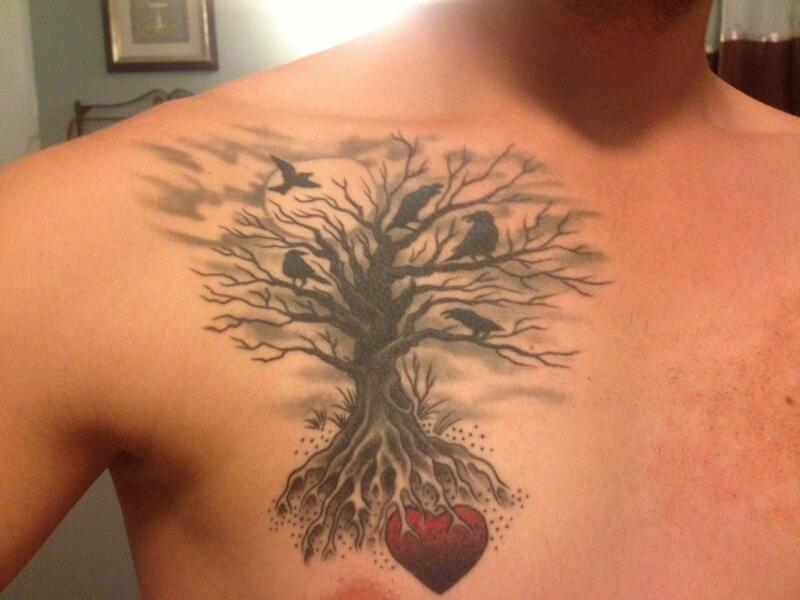 This is an example of a family tree tattoo. I really like how it portrays the connection and emotion associated with the love of family, as well as how some of the family settles in, while others may fly away, as seen by the bird taking off into the sky. Most interesting is the heart under the roots of the tree, which points to family being rooted in love, no matter where they are located. In the image below that it points to each branch of the tree being represented by a different member of the family; each having their own place in the overall scheme of things, along with a unique function. 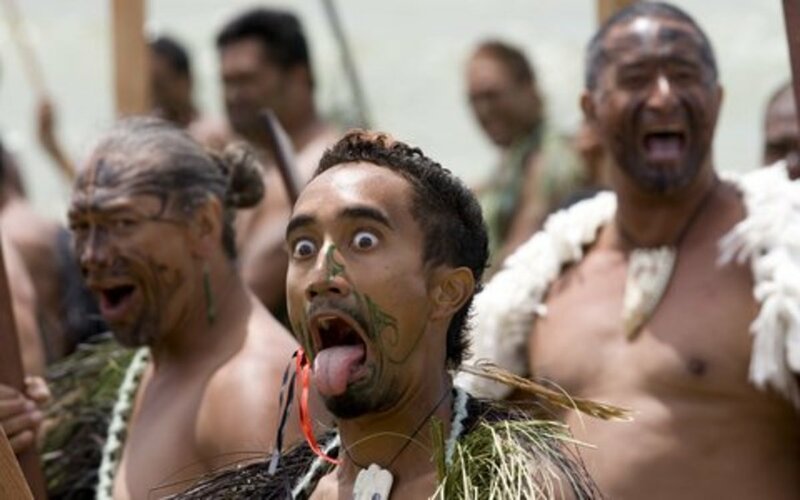 This particular image is fantastic because it could be interpreted to mean a number of things. My first response when seeing it was to think of something happening in life that not only resulted in a broken heart, but also seeming to kill it at the time. Many of us have went through events in our lives where everything not only seemed broken within, but also dead. As for the tree itself, it seems to be totally lifeless and worn out from what happened, as the weight of the hearts pulls it down. It's an amazing depiction of real life, and can mean many things, as shown from the couple of examples above. One thing for sure, whatever it represents, the heart has been crushed. If you're a fan of the Lord of the Rings, you'll have no problem identifying the tree below: It's the White Tree of Gondor. Not only is the tree a terrific image, but the Elven language below it is terrific script, and a piece of art in and of itself. It represents a new beginning and life as revealed in the film, but it's clean lines and unique design are a fantastic design to enjoy, whether or not people understand the meaning behind it. Among tree tattoos the image below is probably the most common; or at least something similar to it. There is usually a flock of birds sitting in the trees or flying away, or a combination of both. 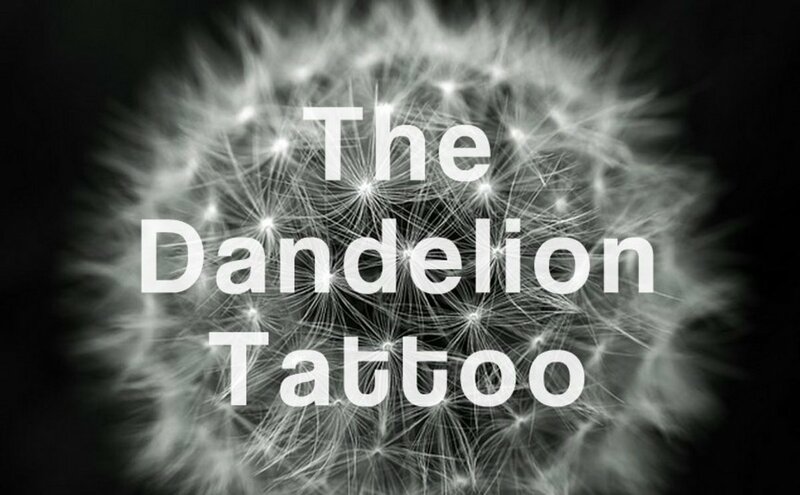 This is a tree tattoo design that always works, and if you're concerned about it being relevant, it's sure to be a good choice. 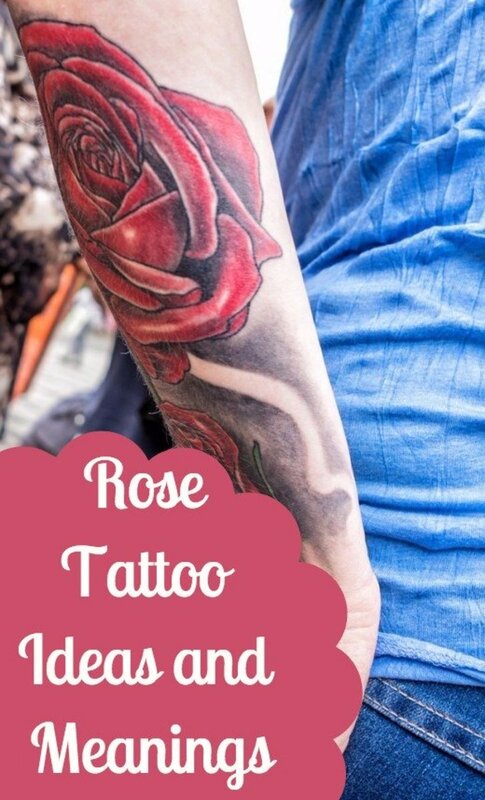 You can also have the tattoo artist alter something a little to give it a unique look in order to differentiate or reflect what it is you're trying to communicate or enjoy. Whatever you do, it's a good option if considering a tree tattoo. The one below it is much different, and is unusual in the thickness of the trunk of the tree. Adding the color is also unique. I don't like this as much as the style above it, but the flock of birds is very well done. While the image below isn't exactly a real attractive one, it really makes you think and consider what it is saying. To me, it's a reference to a dad and mom that have passed on, but have left a foundation for their children and grandchildren, as represented by both being rooted in the ground. Leaves of the trees can also represent characteristics passed on to progeny, and I think in this case that's exactly what it does. It's an usual way of communicating, but a very effective one. 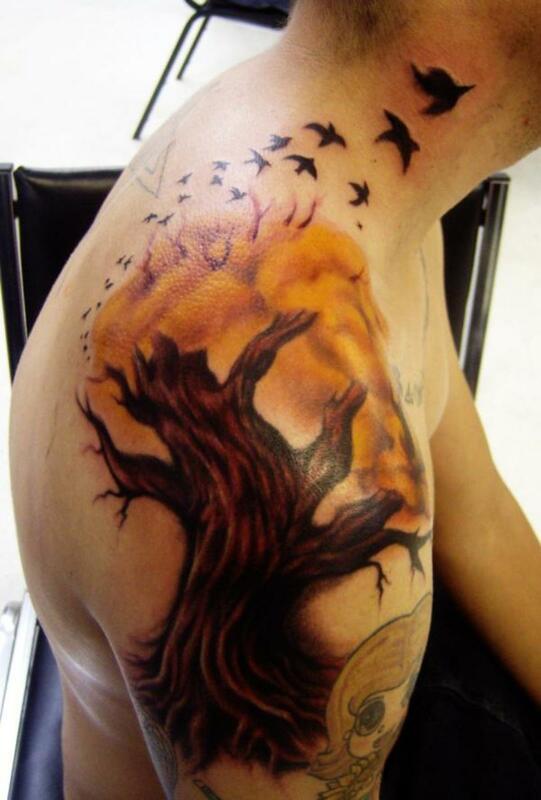 I normally don't like the tree tattoos with thick trunks, but this one really works. I think the reason it does is the numerous branches spreading out in the image. The detail is extraordinary, and the roots give the sense of it being a giant bonsai, if such a thing were possible. Including the gnarly roots as a foundation, it sets the entire work of art up as a somewhat ominous declaration. 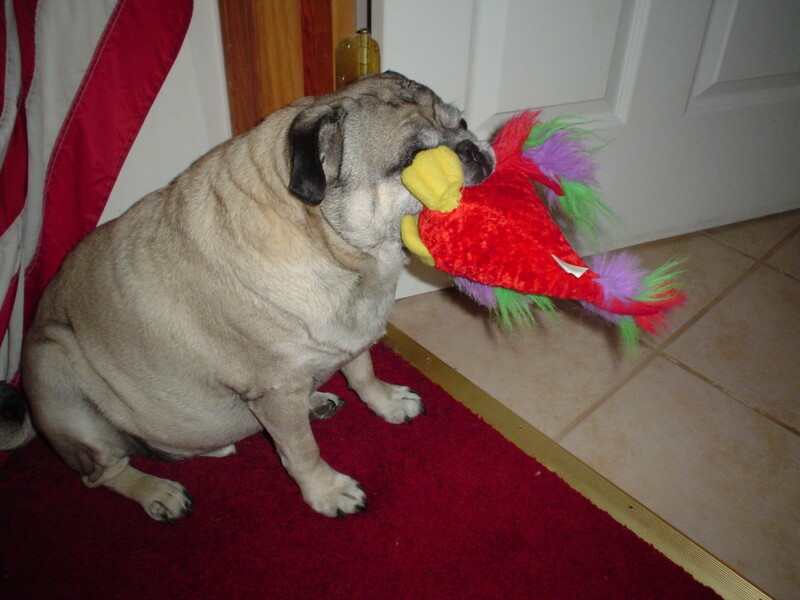 I'm not exactly sure what the compass is included for, but it must refer to a direction being taken. The owl is also a mystery to me, although it really looks fantastic sitting on the branch of the tree. Finally and uniquely, here is this amazing full back tattoo of a palm tree and ocean scene. I don't think from looking at the man with the tattoo, that it's hard to figure out that he's surely a surfer, or at least part of the surfing culture. As for the image itself, it's amazing. Not only the details of the palm leaves, but the reflection of the sun on the shimmering ocean surface. It doesn't get much better than that. I also like the tropical foliage at the bottom of the trees, completing the overall feel and look of the image. From this gallery of tree tattoos, I'm sure you can see why they're such a unique and popular theme among those looking for some unique ink. 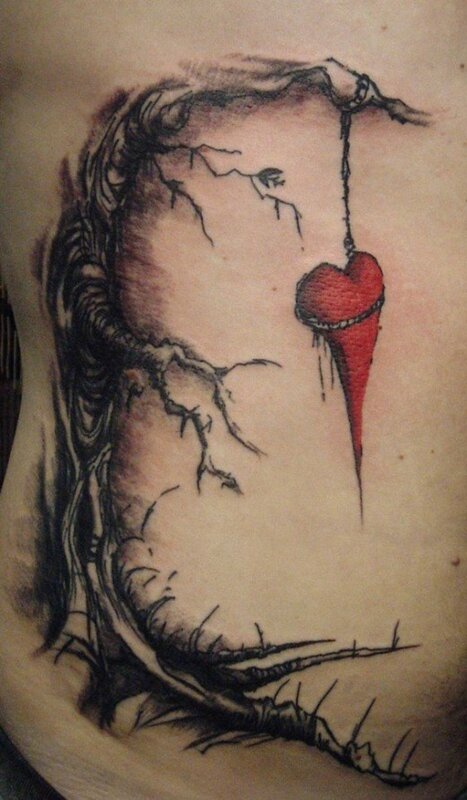 There are of course numerous other ways to design a tree tattoo. For example, I've seen some that have various animals in the scene, depending on what particular tree or trees are desired. I've also seen a number of scenes that include trees, water, foliage and animals; brought together to create an amazing image. These trees were chosen to give you an idea of the type of foundation that can be worked from for an awesome and compelling image. 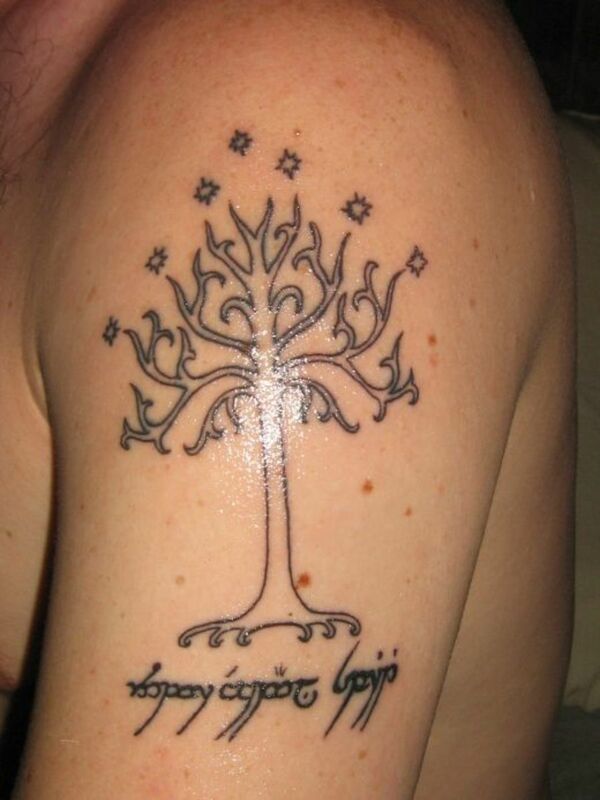 Of course from these tree tattoos themselves, you can set they are amazing just as they are.